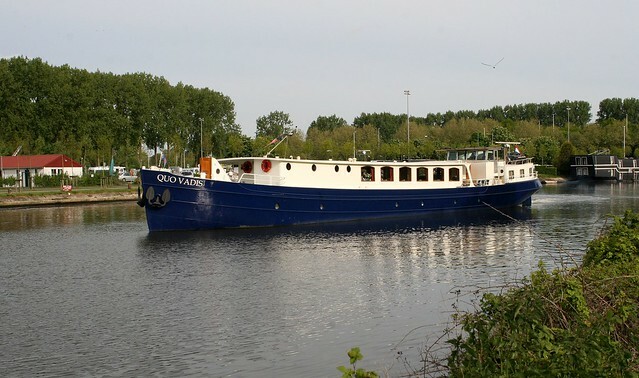 The cosy barge Quo Vadis sails in Belgium. The comfortably furnished and appointed barge which will make you feel right at home was put into service in April 2006 and is owned by the captain, Rendert Jan de Waard. The Quo Vadis sails under Dutch flag and management and is a very popular small barge for cycling cruises. On the upper deck you will find the gorgeous, air conditioned open lounge with large windows, corner seats, TV, a restaurant and small but well equipped bar and a guitar and piano for live music. Wi-Fi is available. The barge also has a beautiful sundeck with awning. On nice evenings or while cruising, you can enjoy the scenery from here.